Coffee is one of the most popular beverage in the world, it is in the Nordic countries that it is consumed the most. It has many beneficial effects on health provided you do not exceed 4 cups a day. According to biological studies, the best time to consume would fall between 9:30 am and 11 am. It is not well defined, nor the beginning of the consumption which is sometimes located in the XII th or XV th centuries. It would have been first consumed in Ethiopia and Arabia and arrived in Europe in the sixteenth century. Whether in the Arab world or Europe, for permission to drink coffee and more again opening coffee shops has often been a source of conflict between the Orthodox or the rulers and the people. Always the last finally win. Or express, provides in cafes, machine increases the water pressure in the powder of strong coffee. Espresso with milk foam and chocolate powder. Espresso with light milk and whipped cream, chocolate powder. 1 third coffee, 2/3 milk and a few chocolate. A volume of whiskey for three volumes of coffee. Many other liqueur coffee exists. Antioxidants fight the effects of free radicals. Reduces the risk of Parkinson's and Alzheimer's. Protects the brain against the effects of cholesterol (one cup a day). Combat the diabetes and cirrhosis of the liver. It reduces the risk of suffering from asthma. It is beneficial to the stomach. It is mainly attributed to caffeine, but not only. Too much coffee can promote anemia, especially among women and children. Weaning for a person whose consumption is average (235mg of caffeine per day) lead to depression and anxiety for a person on 10. For women, it would reduce the size of breasts. Dehydrating. Bad during sport practices. Helps to increase the urinale excretion (that can be easily offset if you have the opportunity to drink!). A 2013 study found that drinking more than four cups of strong coffee per day increased by 50% mortality before 55 years. There is a correlation, causation remains to be defined. According to a study published by Nature, regular consumption of coffee causes an addiction to the anxiogenic effect, so it makes no longer depressed between two cups, but also used to the alertness: he makes no more alert and vigilant. apathetic and we must drink it only to regain a normal state. Decaffeinated coffee has a significant remaining dose of caffeine. If one does not abide coffee, because for exemple such a tension too high, tea must be preferred thet also contains caffeine, but diffused over time. Distribution of cultures according to the types of coffee. Legend: R) obusta A) Rabici M) Both. Coffee protects the brain. It neutralizes the damage of cholesterol. Too much coffee may reduce breast size. 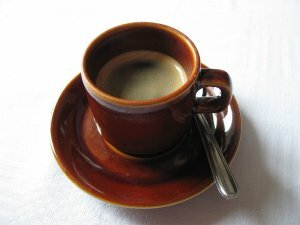 Coffee reduces risk of Alzheimer's. Coffee combat Alzheimer's disease. Another study earlier. No coronary artery disease due to coffee. Cosig. Site mentioning many scientific studies. Coffee Research. Aroma and acids in coffee. Anxiogenic and alerting effects of coffee.